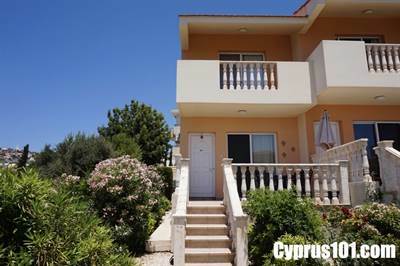 Home »Cyprus Property»Townhouse For Sale in Peyia, Paphos Price Reduced! Townhouse For Sale in Peyia, Paphos Price Reduced! This beautifully presented 2 bedroom townhouse is nicely tucked away in a quiet corner of a quality development in Lower Peyia, a few minutes’ drive from the popular holiday resort of Coral Bay. This Peyia property is maintained to an excellent standard and being semi-detached, has additional windows providing lots of natural light, extra outdoor leisure and garden space, plus a private driveway with large parking space for at least one vehicle. The ground floor accommodation features a guest WC and useful storage area, fully fitted kitchen with dining space and a comfortable lounge with sliding patio doors opening on to a spacious outdoor veranda overlooking the beautifully landscaped gardens and sea views beyond. On the first floor is the master, second bedroom and bathroom. Both bedrooms benefit from having direct balcony access and the enjoyment of fabulous sea and/or mountain views. The communal facilities are equally as impressive and include a luxury swimming pool with central arched bridge and roman steps for easy access, plus shower and toilet facilities to the side. A large sunbathing terrace provides the perfect space for picnics and sunbathing, whilst enjoying the surrounding mature landscaped gardens. Tastefully furnished and ready to move in, this property is an ideal holiday home or rental investment and has full title deeds.